A technique for storing data using individual atoms has been announced by scientists in the Netherlands. The rate at which human are generating data is exploding. Over 90% of the data we've ever created was produced within the last few years, and every day we churn out more than 2.5 million terabytes of new material. When the Square Kilometre Array switches on in Australia and South Africa later this decade it will generate more data in a day than the entire world currently turns out in a year. The problem is where and how to keep all this information, because storage technology has not stayed in step with rates of data creation. Now scientists may have a solution. Writing in the journal Nature Nanotechnology, Delft University of Technology's Sander Otte and his colleagues have developed a technique that uses chlorine atoms sitting on a copper surface to store information at an unprecedented high density. Their approach stores more than 500 terabits per square inch, which is more than a thousand times better than current hard disc technology. The technique works by evaporating and then depositing chlorine atoms onto a piece of copper. Chlorine atoms would normally fill up the surface completely, but the team carry out the deposition in such a way that gaps are left in some places on the surface. The gaps constitute "vacancies" that chlorine atoms can be pushed into from elsewhere on the copper grid. And when an atom is moved from one position to the next, that can constitute a "bit" of information equivalent to a binary code nought or one. The effect is similar to the puzzles popular with children that involve moving around small squares that - together and in the correct positions - make up a picture. The atoms are manipulated with a scanning tunneling electron microscope (STM), which has a very sharp tip capable of registering the locations of individual atoms on the surface. Information is written into the storage system by the same microscope tip, which applies a small current, measuring a microamp or so, to a individual chlorine atom. This jolts the atom one notch along the copper surface. 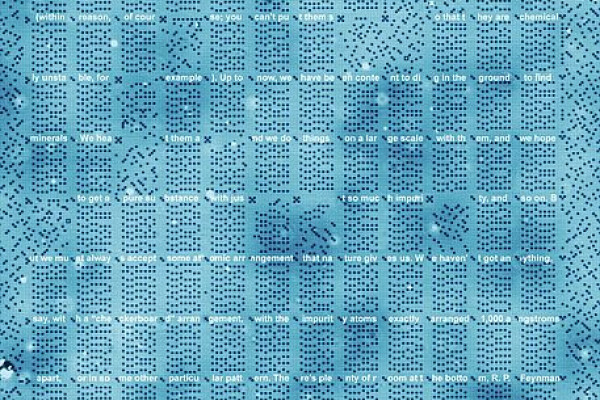 Computer giant IBM made history 25 years ago when they arranged 35 xenon atoms on a surface to spell out the company name, and previously information has been stored by depositing silicon atoms onto a gold surface, but in these cases the data was indelibly written and could not be changed without regenerating the entire surface. Otte's approach is readily re-writable. Capable of storing a prodigious amount of data as it may be, all that glitters is not gold, or even copper, with the new technique. The operating temperature needs to be kept below 77 Kelvin (about minus 200 Celsius), and its very slow. One kilobyte (1K) of data takes an hour to read and 3 hours to write. But, as Otte is at pains to emphasise, they haven't optimised it for speed or operating conditions yet; it's a proof of principle.